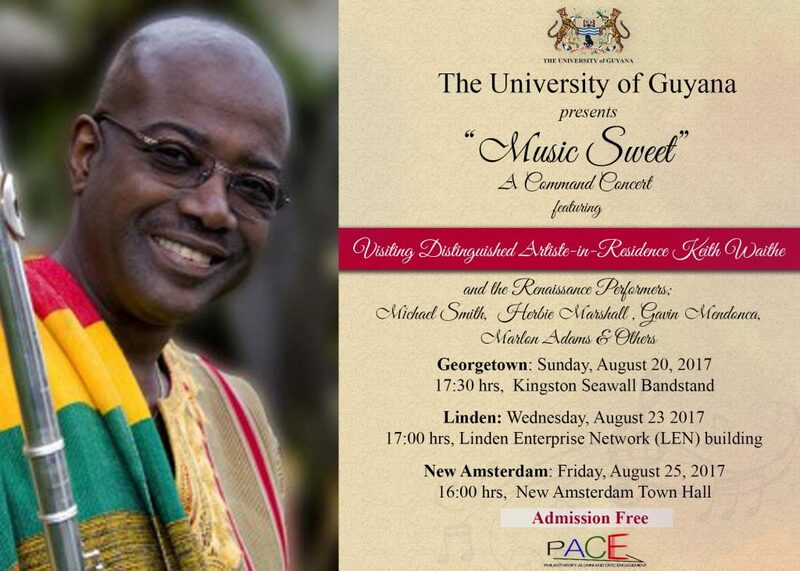 A special invitation is extended to you and your family and friends to attend an evening of Sweet Music on Sunday, August 20 at 17:30 h on the Kingston Seawall Bandstand; featuring Mr Keith Waithe, flautist, visiting Distinguished Artist-in-Residence and the Renaissance Performers. For persons living in Linden, the concert will be held on Wednesday, August 23, 17:00 h at the Linden Enterprise Network (LEN) building. And for the Berbicians, the concert will be held on Friday, August 25, 16:00 h at the New Amsterdam Town Hall.